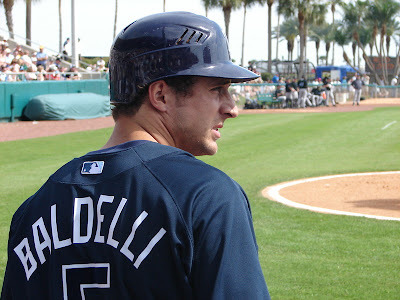 According to Ken Bell of ABC6.com is reporting that Rocco Baldelli's family has been informed by doctors at the Cleveland Clinic that the previous diagnosis of the potentially fatal Mitochondrial Disorder was a mistake. Instead they believe that Baldelli has Channelopathy, a non-progressive, highly treatable disease. Channelopathies are inherited diseases caused by defects in cell proteins called ion channels. Cells of the body, including nerve and muscle cells, are surrounded by thin coverings called membranes. Embedded in these membranes are a large and varied set of proteins that control the movement of materials across the membrane, in and out of the cell. One major type of material that crosses through such proteins are called ions, and the proteins that transport them are called ion channels. Ions perform many different functions in cells. In neurons (nerve cells), they help transmit the electrical messages that allow neurons to communicate with each other, and with muscle cells. In muscle cells, they allow the muscle to contract. When the ion channels are defective, these activities may be disrupted. It mean that one of the most disappointing developments of the last several year may not be as terrible as we once thought. It means that Rocco Baldelli still has a chance at becoming the next Joe DiMaggio. This is good news for the Baldelli's and for fantasy leaguers.